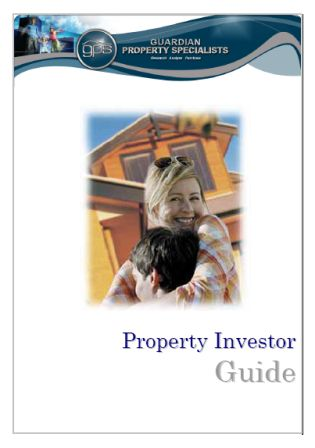 The Property Investor Guide is a great introduction and reference guide to the property investment market. Developed specifically for the first time investor, it gives an immediate insight into property investing with easy to understand concepts and graphical aids. This 34 page guide explains what is involved in buying an investment property from locating the property to managing it effectively. It also answers many frequently asked questions to help you find your way through the investment process. This guide also provides useful questions to ask your financial planner, accountant and solicitor in order to enhance your understanding of the process. To download your FREE Property Investor Guide, please fill out your details below and you will be prompted to the next screen after clicking on the Submit button below.